I tried to “go with the wind” once. I failed, epically. When visiting California, I knew I wanted to go to Los Angeles and San Francisco, however, I didn’t know how long I wanted to stay in each city or exactly what I wanted to do in each. What if I found a bunch of things I wanted to do in the city and wanted to linger in one particular city a little longer? What if one city turned out to not be as interesting as I thought and I wanted to move on? Maybe I misinterpreted what other travelers meant by “go with the wind.” Maybe they do at least some trip planning. I did no such thing. I didn’t reserve rooms at a hotel, didn’t buy tickets in advance, nothing. I didn’t want to be bogged down with set dates and times. I wanted to be free to do whatever looked interesting and overall just explore. In the end my trip to California ended up being less enjoyable than if I had just planned everything in advance. I felt like I spent a decent amount of time just trying to figure out things to do, and to me, that’s time wasted. That’s time I could have spent actually experiencing the city instead of doing planning and research. 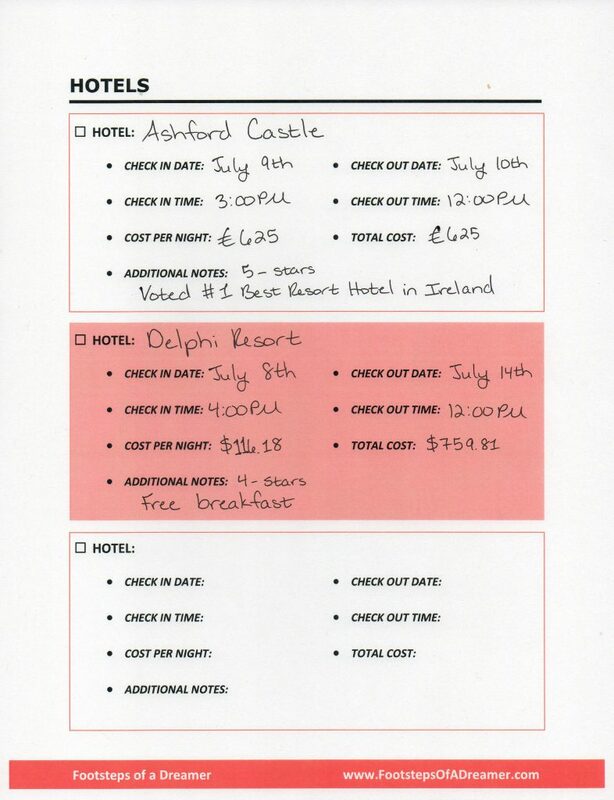 Plus, I found that a majority of three-star hotels (where I usually stay when traveling) were sold out, so I was forced to stay at four and five star hotels, completely blowing my budget. 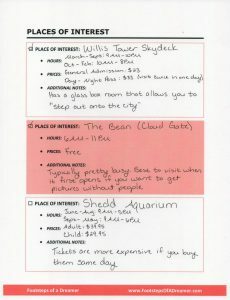 Also, tickets for popular attractions such as visiting Alcatraz had sold out weeks in advance. I still enjoyed my trip to California, but I think it could have gone much better. At the end of the day, it just boils down to what kind of person you are. I am the person who feels less stressed when I have some sort of plan of action. However, I am careful not to let myself get set in stone. 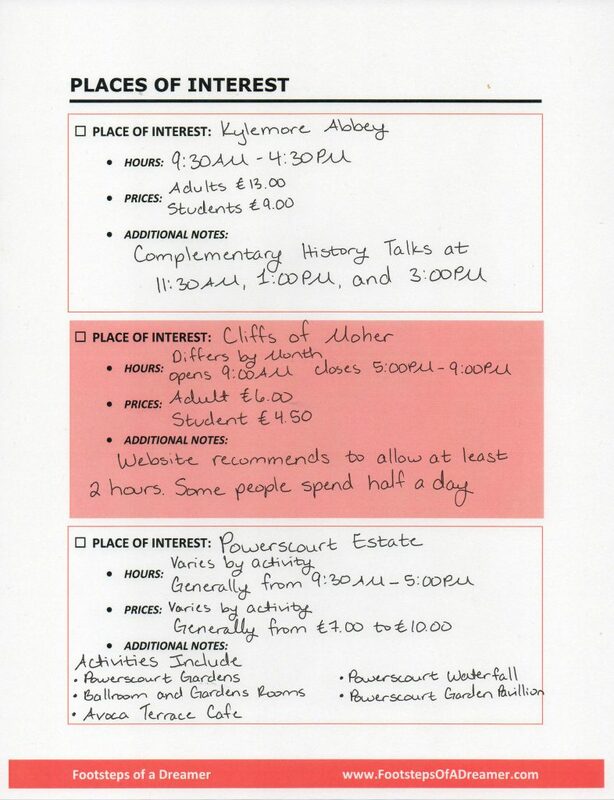 I’ll draft up an itinerary just so I’m not wasting time trying to figure out what I want to do, but I’m happy to adjust or completely change my itinerary if I find something else I want to do. 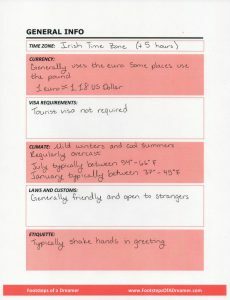 For every trip, most people do some basic research: best times to visit, places to go/things to see, where to stay, etc. However, that process can be quite time consuming and stressful. When I first started traveling, I would usually write down my research on a scrap piece of paper or maybe in a word document. There was absolutely no organization or methodology to my research. I would look at places to go, then I would look at hotels, then more research on places to go, then research transportation, and so on. Often times, I would look back at my notes and not be able to understand what I had meant, so I would end up having to google some of the things I had written down to refresh my memory. When I talk about traveling with other people, one of the biggest complaints I often hear is how much of a pain the planning process can be. I think it’s one of the many reasons people don’t travel more, so I decided to make my planner available for everyone to use! Get your FREE copy of A Dreamer’s Guide to Trip Planning! 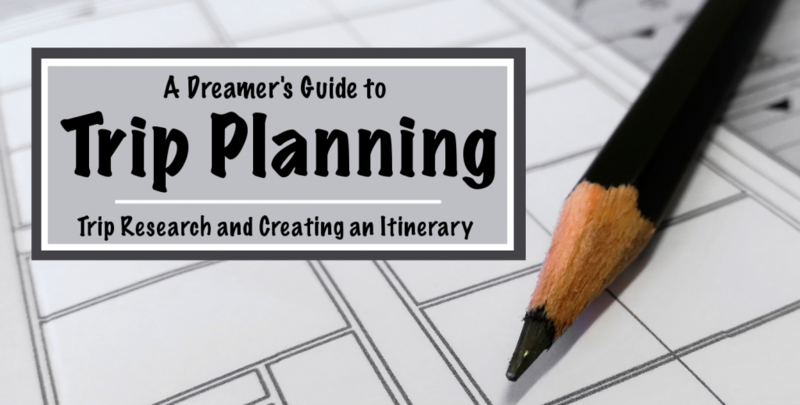 Then, keep reading to see how I use the planner to streamline my trip planning. 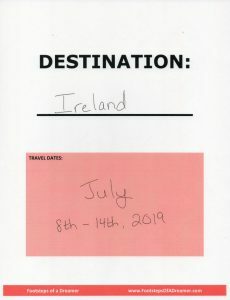 For convenience, I’ve included pictures of how I used to planner to organize a domestic trip (to Chicago), and an international trip (to Ireland). You can click on the photos to enlarge them. This is sometimes the hardest part. When there are so many cool and amazing places in the world, how do we possibly pick a destination? You can check out my post “Decide Where to Go Next” if you need a few tips to get you started. Keep in mind that the destination you pick isn’t necessarily where you absolutely have to go next. A lot of times I’ll start doing trip planning for multiple destinations just to get an idea of how long I would want to be there and how much it would cost. That is usually my deciding factor for where to go next. What time zone is the destination in? Am I going to have to deal with jetlag? Am I going to have to exchange currency? How hard would it be to get to this destination? Do I need a passport? Do I need a visa? What’s the weather like? Are there certain times that are better to visit than others? Are there any laws, rules, or customs that I should be aware of? Of course, not all of these questions will apply for every trip. However, when they do apply, it’s very useful information to have. Typically, one of the first things I do once I’ve picked a destination is start looking at how I’m going to get there. If I’m staying within a reasonable distance of home, I’ll typically drive to my destination. Long road trips are sometimes half the fun! Otherwise, I start the process of researching flights. There usually isn’t a whole lot of planning involved with road trips unless maybe you are traveling with several people or a few kids. 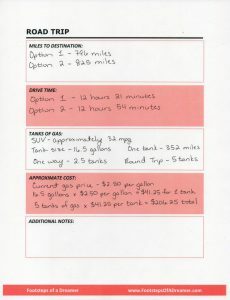 Most of my research usually just involves trying to figure out how long it will take to get there and approximately how much it’s going to cost for gas. 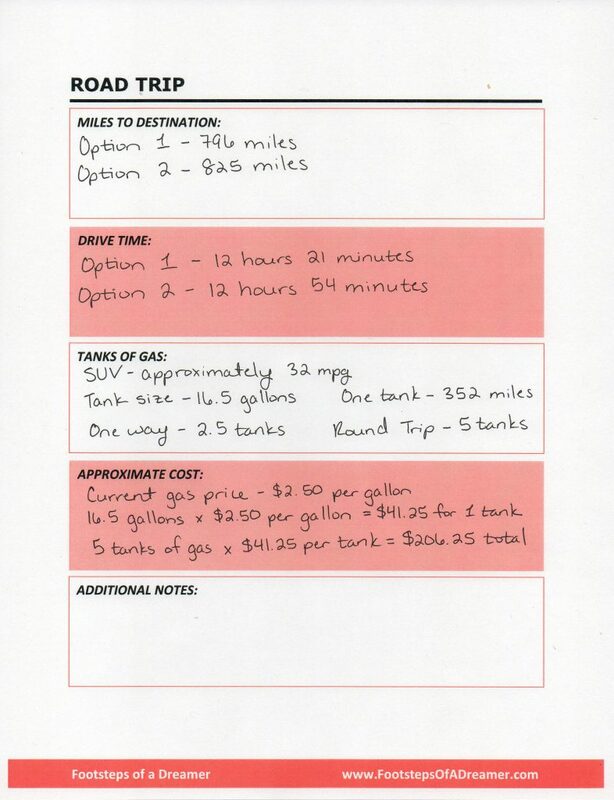 Estimating the cost of gas for the whole trip of course requires knowing the tank size in your car and how many miles per gallon it gets. However, a quick google search of the year, make, model of your car should be able to get you that information. However, if you’re flying to your destination, that is usually much more involved. Making sure you get a decent flight at a good price can definitely be difficult. It’s so easy to get lost between all the different websites and flights that you take into consideration. 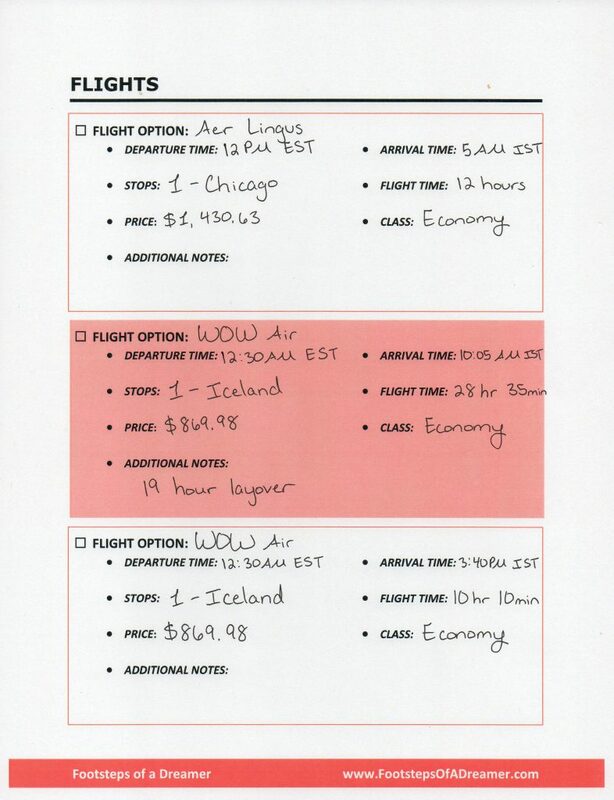 When I find a decent priced flight, I’ll jot it down, and I’ll do this over a couple of days, maybe even weeks, so I can see how prices might fluctuate. 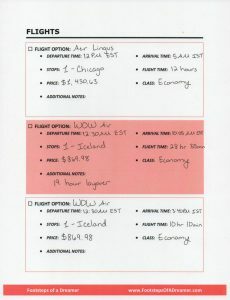 Then, when I’m ready to actually book my flight, it’s easy to figure out which flight I want because I have it all in my notes! My favorite part of trip planning is finding all of the cool and unique things I can do and experience at my destination. I scour the internet, looking for inspiration, and write down anything and everything that looks even remotely interest, knowing full well that I won’t be able to (and probably wont want to) do everything on my list. When I go back and actually take a look at the list I’ve made, these notes help me decide which things I actually want to do. The format of the planner helps me easily compare and contrast my different options, and then I can put a check mark next to the activities and places I eventually decide on. Researching where to stay is usually one of the last things I do. There is no point in staying in a hotel on the west side of town if everything I want to do is on the east side of town. Of course, there are exceptions to that (it’s a resort I really want to stay at, I can get a cheaper price, etc.) Still, I usually like to have some idea of what I’m going to do before I start looking at where to stay. For me, hotel research isn’t usually too involved because I typically stay in three star hotels. 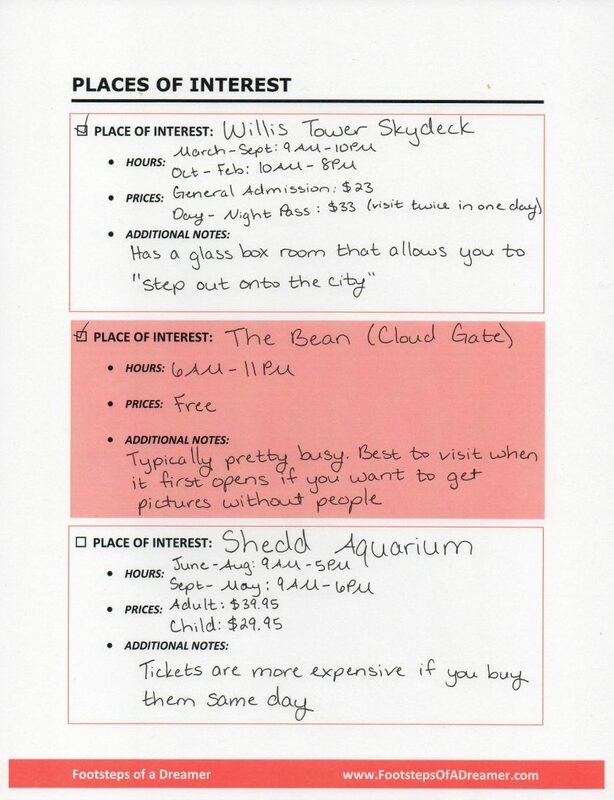 I find the cheapest ones for the dates I’m interested in, and then pick a hotel based on guest reviews. Typically, I only look into maybe three or so hotels. However, this process can become more involved if you have multiple dates you are considering or you are staying in more than one location. It also has a place for you to check mark which hotel you finally decide on. Depending on where I’m going, there may be several different options for how I get to place to place. I can walk, drive, ride a train/bus, get a taxi/uber, and more. I sometimes only use one of those options, and other times I may use all of them. Personally, I lean towards walking or taking public transit, as those are often the cheapest modes of travel. In some cases though, public transit might not run frequently enough or get me close enough to my destination. 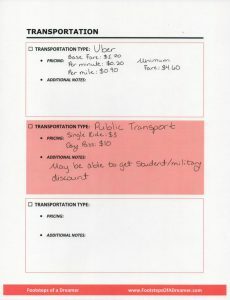 Other times, if I’m traveling with other people, sharing a taxi or uber might actually be cheaper than all of us paying for public transit. For that reason, I tend to research multiple modes of transportation. Are there any buses or trains that are close to where I’m at and go close to my destination? How frequently do those run? If I miss the bus/train, how much trouble will I be in? How much does each ride cost? Do they offer day/week passes? 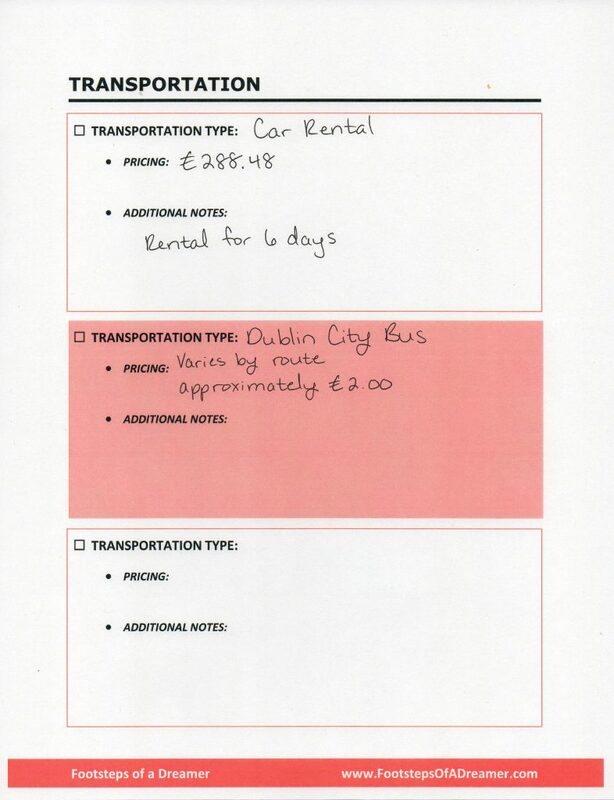 What’s the pricing model (base fare, price per minute, price per mile)? What’s the bare minimum price? Would I be splitting the cost with other people? 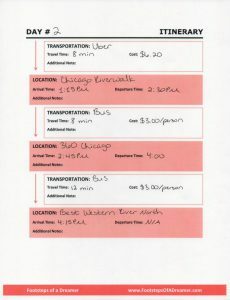 Like before, you can check mark with transportation options you decide to use. Finding places to go might be my favorite part, but to me building the itinerary is probably the most exciting part…and the most stressful. This is the time when I have to try and figure out how to fit all the things I want to do into the limited amount of time that I have. I want to maximize how much I get to do without feeling like I’m rushing through places. Thankfully, Google has this wonderful thing for MOST attractions called “Plan Your Visit.” If you simply type in the place you are interested in going, on the left hand side it show details about your destination. Towards the bottom of that section, it shows popular times and how long people typically spend at the destination. Of course, this number can vary greatly depending on the type of person you are, but it gives you a starting point. Also, forums and reviews can be great places to see what other people are saying about how long they spent at a particular place and why. I highly recommended writing this section in pencil. I’m constantly making changes to my itinerary based on new things that I learn. While I don’t mind a few pen scratch marks, after a while they tend to make my planner hard to read. The idea is to make my life easier. I don’t want to be struggling to read what I wrote around all the scratch marks. Remember all those places where I wrote down the costs of all those individual activities, hotel prices, transportation prices, and more? This is where it all comes together. 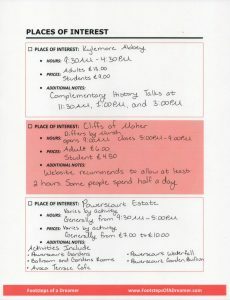 I tend to use this page hand-in-hand with my itinerary page, since cost usually determines which places I decide to go to and how I intend to get there. 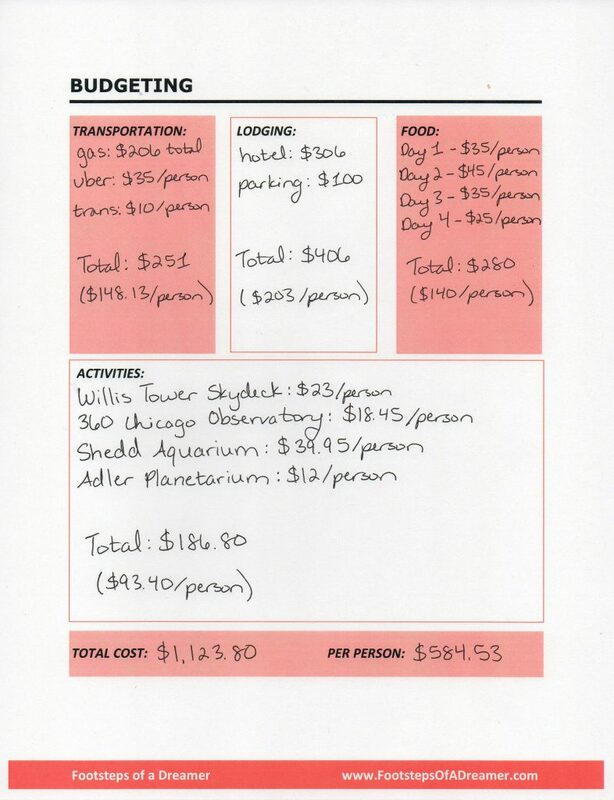 If I have a set budget for my trip, I’ll use this page to play with numbers in order to maximize how much I do with the money I’ve got. If there’s no set number, I’ll just use this page as a place to add all the numbers together. 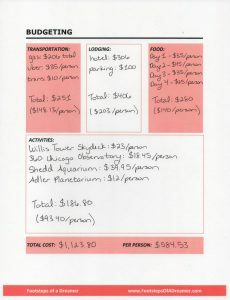 I also use it as a place to divide costs, since I don’t frequently travel by myself. Things like food, entrance tickets, and things of that nature each person typically pays individually. 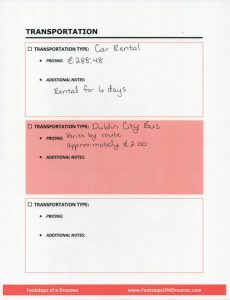 However, I tend to split hotel costs, taxi rides, and such with whoever I’ve traveling with. I use it as a place to figure out who is going to cover what costs. The very last section is my free-for-all to write down anything and everything else comes to mind. I almost always right down the sunset and sunrise times, for various reasons. I love taking pictures of the sunrise or sunset, but I’ve also found it helpful for other reasons. Very few people are up before the sun, which means if I want to get a picture of a place without too many people, doing it before the sun is fully up is probably a good time. 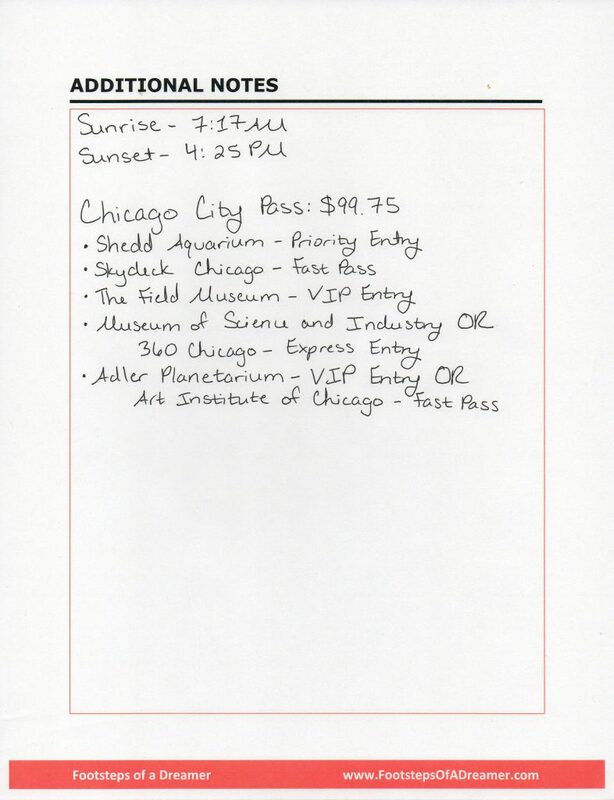 Other things I might write down are tour packages or attraction passes, as these often consist of multiple activities and places, meaning that they don’t really fit into one particular spot in the planner. 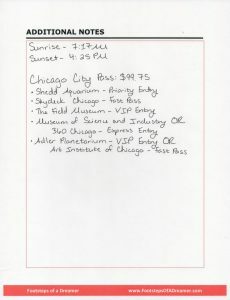 It’s an easy place for me to write down the details of the tour or pass so I can easily remember everything it covers. What do you think? Are you ready to start planning your next trip? Are there other things you typically do during trip planning that wasn’t mentioned here? Feel free to let me know in the comments below! Don’t forget to get your FREE copy of A Dreamer’s Guide to Trip Planning! I don’t think I could ever be as organised as you but it is a great guide nevertheless. Yeah, I’m probably a little bit more organized than most, but if I can help other people add a little more organization to their life and a little less stress, I’d consider it a success! This is awesome! I want to plan our first (big) family trip for next summer and this is the perfect tool to keep me organized! I’m the type that will jot down random things here and there, some on the computer somewhere, some written down, with bookmarks in random folders. Thanks for sharing your planner! Yep, I’m like that too. I write EVERYTHING down because that’s the only way I can remember things, but it does me no good if I write everything down in different places! Hope you enjoy the planner! Very helpful guide! Some people get overwhelmed trying to plan a trip, but you broke it down very well. 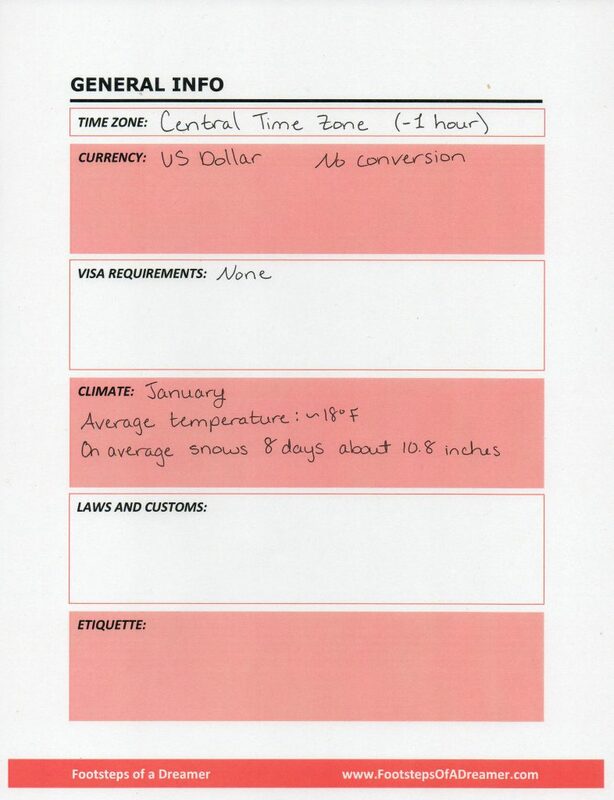 Figuring out your destination, time frame, and if you need a visa are definitely the most important first steps. 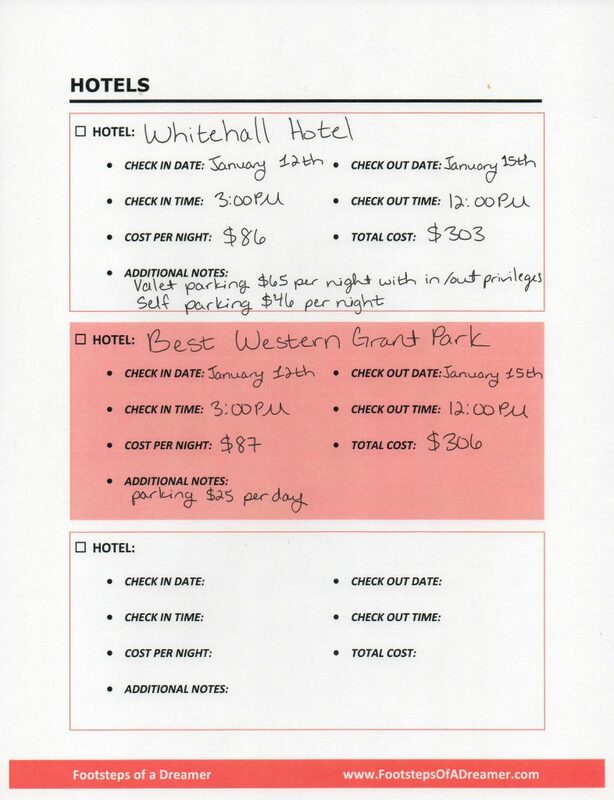 I definitely used to get overwhelmed with the whole trip planning process. This actually started out just as a template to help me organize my thoughts, but thought other people might find it useful too, so I turned it into this guide! Your planning looks awesome. I guess I do a hybrid ‘go with the wind’. I usually have one reason to be there – and some accommodation booked. But then I like to explore. Maybe I should try planning too – I know when someone else does it for me I really appreciate it! Being that most of my travels are only a free days I am very much a planner and a researcher. 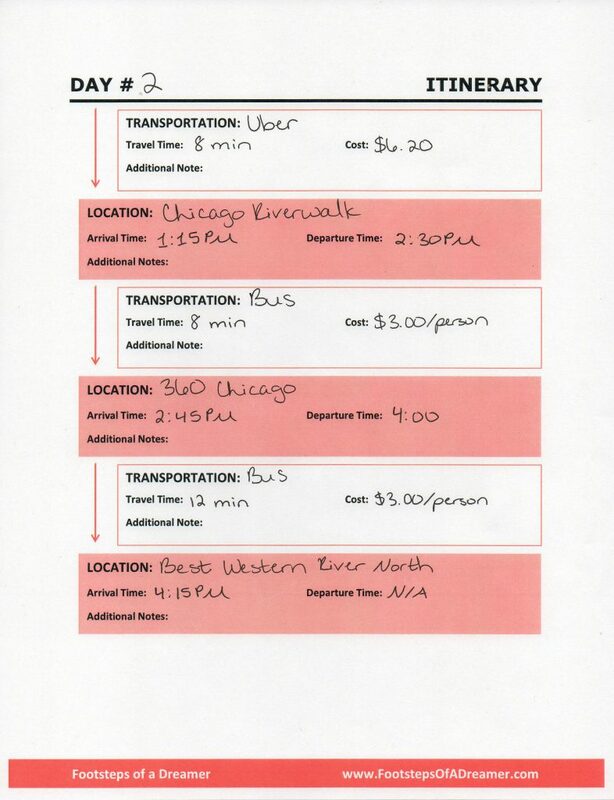 Don’t forget to look at tours, sometimes paying a little extra takes a lot of the stress of trying to figure out transportation and timing. I do A LOT in OneNote. I love it because it automatically syncs between my phone, laptop, and desktop. However, when it comes to things like trip planning and brainstorming in general, I love to write things by hand. I just feel like I can organize my thoughts better when I’m physically writing things out. I guess I’m not as detailed-oriented as you are, I jot down some notes and print out some loose itineraries and away we go. I usually travel with my husband and we have a fair division of labour: he does transport and accommodation, and I do activities and food. This way we share the burden of planning. Having somebody else to help you with the planning definitely makes things easier. Personally, I use the planner as a way to organize the otherwise random notes I might jot down. 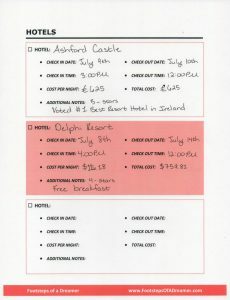 I find it best when trying to compare what items to add to my itinerary. To each their own, right? It is so wonderful to find someone who plans the way I do. I used to be such a hot mess and just “go with the flow’ but I learned quickly that it was not my travel style and did not work for me. Yes! A lot of friends give me a hard time for the way I seem to over-plan my trips, but they don’t understand the major struggle I go if I don’t plan it all out. What a fabulously detailed post. 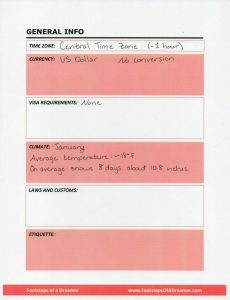 I thought that I was a good planner, but you have covered thing that did not even occur to me like the tip for checking local customs and rules. Good advice! It wasn’t something I used to do either until my trip to Japan where the culture is much different from the US. I figured doing some basic research before hand might help me overcome some of the culture shock on further trips. Part of the fun of traveling for me is the trip planning and anticipation so I enjoy all of the pre-trip things. I’m pretty sure I’m not as organized as you are though! Looks like a good guide. A woman after my own heart! 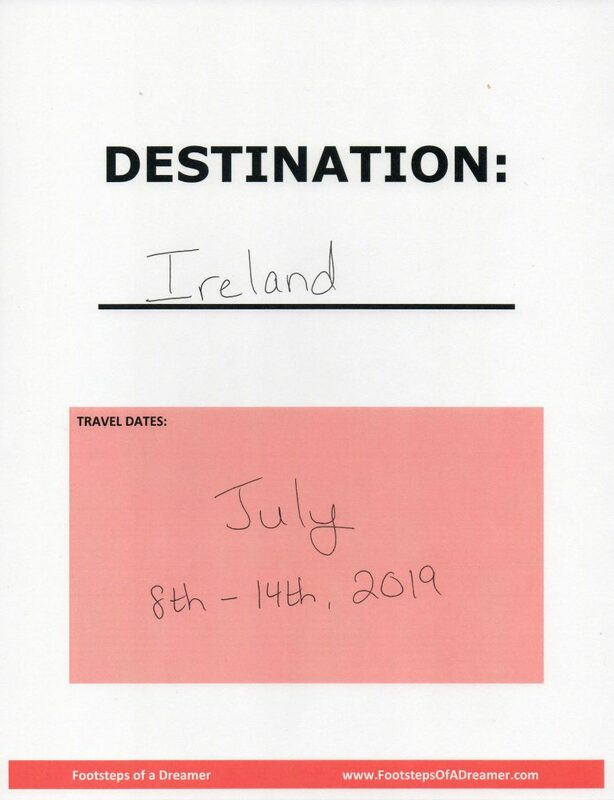 This is exactly how I plan my trips too!